It's not often you hear that kind of title in a blog post. But it's true. Well, they look like pickled brains to me. The pickled brains of small mammals. Or something that you might find growing off the side of an old tree. Yes, they're one of the latest releases from Battlefront/Flames of War. They certainly get my vote for the daftest and worst looking wargames accessory ever - and remember, I'm someone who thinks themed dice sets are really cool. What are they actually supposed to be? 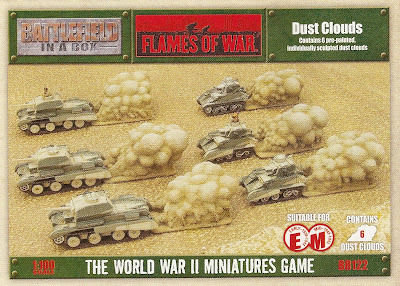 'Dust Clouds', for your desert war games. Product code BB122. Check 'em out when you can. I believe they're to be released in September, but you heard it here first. Guaranteed to bring the hobby into disrepute. And which of these two thoughts is more frightening - that even as you read this, someone is pre-ordering a box of these? Or that adults acting in cold blood conceived and designed these things, stood back and thought: yeah, they're great!? Ah well, that's the best laugh I got from WI issue 287. The first magazine of my subscription, and already I'm thinking: subscribe in haste, repent at leisure. The ACW theme takes over a big block of the issue, and I'm not really into ACW. And there's something about the whole thing that puts me off. Have any readers been in a nightclub and thought - this is too noisy, too many flashing lights, get me out of here? Or felt the same when visiting a funfair at night? I got a similar feeling from WI 287. Too many flashy graphics, too many large colour pictures, too many miniatures painted to collector's standard. It makes my head spin. I need something more sober. Anyway, enough negativity. The articles are in fact mostly well written and have solid content. I'll keep an open mind. Maybe at some point in the not too distant future I'll get round to playing a game or doing some painting, rather than just pontificating. You'll be the first to know. I recently received an email from Henry Hyde of Battlegames magazine, who was clearly extremely cross that I had used two maps from his magazine on my blog without permission. 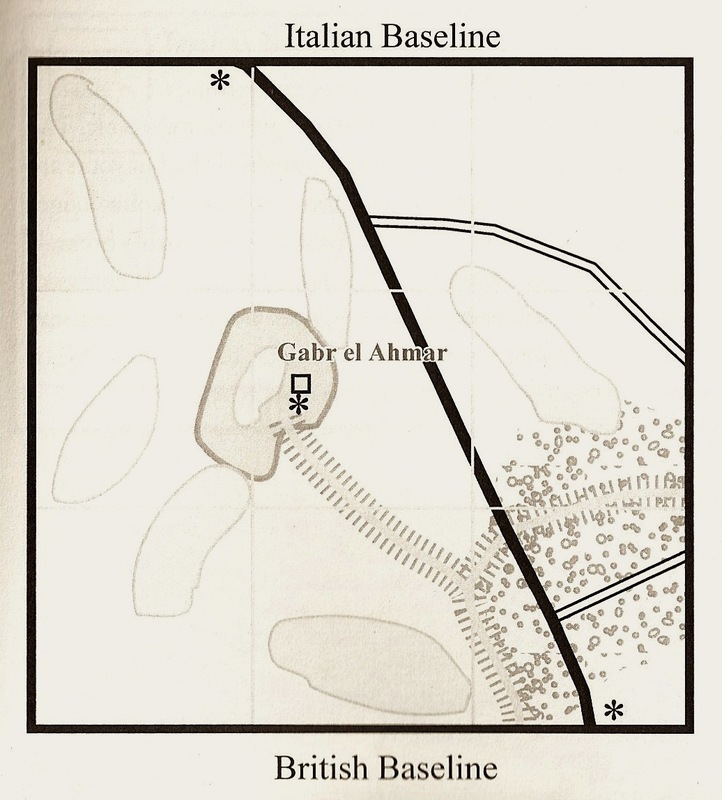 The maps were originally featured in the posts 'Chance Encounter' (WW2 Poland) and 'Black Powder: The Minimalist Approach' (SYW). This blog does not exist to genuinely offend anyone, and Henry was clearly genuinely offended. Therefore my first duty is to apologise. The maps have duly been removed. However, I feel I have a right to justify my actions, and to say I feel a little offended in return. My personal view is that the images were correctly credited to Battlegames, were clearly used for no personal gain, and were likely to bring credit to the magazine and its editor. Maybe they would even result in extra sales. I said in the SYW post "I hope I'm not going to get into trouble for scanning in the map and presenting it below". I guess I have egg on my face. But that tongue-in-cheek comment expressed the belief that if the copyright holders did see the post, they would realise that no harm or loss to them could possibly result. Naively, I also expected them to see that I was posting in an innocent spirit of sharing my sources of inspiration. Of course, had I taken the trouble to contact Henry and ask his permission, he may well have given it, so not doing so was clearly a mistake. But I genuinely thought no offence could possibly occur considering the context. As readers will note, numerous examples of images and text scanned in from various sources or dragged from the internet have been used throughout this blog. Three occur in the post preceding this one. This is done to show where I get my inspiration from, and to share with others the best that the hobby has to offer, in a spirit of genuine appreciation. I admit they help to bring a splash of colour to the blog, but they also represent free advertising for all the products and publications featured. I expect they all represent breaches of copyright. If I am to receive further irate emails from copyright holders it might be best just to give up. The only thing I gain from this blog is the pleasure of sharing my activities, ideas and sources with other gamers. Legally it seems I am at fault but I feel no moral qualms. Perhaps readers (maybe even Henry himself) would like to put me straight. Be as brutal as you like. Best wishes to all, Keith. I am indeed proud (in a small, non-boastful way) to have accumulated 50 followers. It was only a few months ago that this little blog only had 2 or 3 followers, but word seems to have got round. Or maybe it was putting the display widget for followers in place that did the trick. I demurred from posting any self congratulation when I passed 20,000 hits, so I will allow myself this little pat on the back. Even more pleasing is that a modest but steady stream of comments now greets each post, usually with friendly messages or interesting and useful suggestions and information. Thank you to every follower, commenter or reader. Well now, I am asking myself whether I have abandoned my prejudice or my principles. 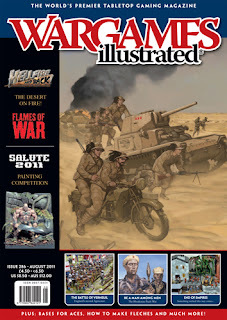 To come straight out with it, I have signed up for a years subscription to Wargames Illustrated, influenced in no small way by the possibility of some shiny new toys. Let me tell you briefly how it came about. 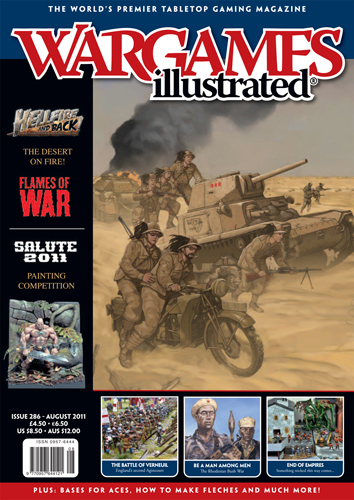 Here we have the latest issue, WI286. I bought it because the theme on Beda Fomm would be of interest, and I needed some undemanding holiday reading. I found that the magazine continues to be a pretty good read. No slippage yet towards a Flames of War/Battlefront house magazine, beyond what was evident from the start. I don't really like magazines with themed editions, but on the evidence of this issue WI has been sensible enough not to let the theme take over the magazine. And then there were the subscription offers. £48 gets you 12 issues, so that's £4 an issue rather than the £4.50 cover price. 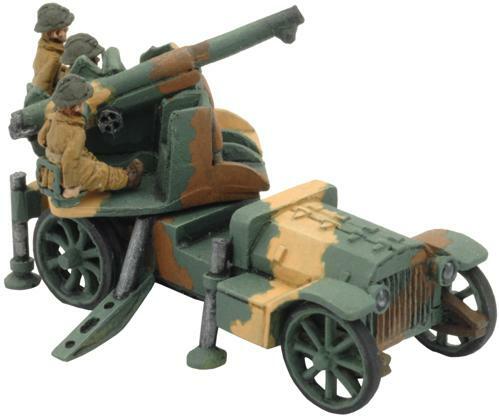 Plus you can choose a free box set, one of which turned out to be a French self-propelled 75mm AA platoon. 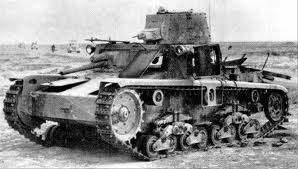 Now just a minute - those are the same elderly De Dion Bouton vehicles mounting 75mm guns that were used by the Poles in 1939 (see this post). This was a chance to get hold of an esoteric vehicle that I never imagined would become available as a model in 15mm. Alright, a box set of 4 was more than I wanted (this is definitely a pattern - see previous post), but they were free, for goodness sake. They duly arrived just 3 days after ordering, and are indeed very nice models. Having more than I need I can produce the vehicles in 'travelling' and 'firing' configurations. As for the magazine, I will have to trust WI to continue to be varied and interesting. Regarding abandoning principles and prejudices... Well, I've nothing against FoW as a rules set, or Battlefront as a manufacturer of wargames figures and vehicles. The models I have bought have all been good. But I do rather dislike the Games Workshop style, one-stop-shop approach which they have brought to historical wargaming. And I resent the endless supplements. And I get the feeling I've been suckered in by some clever marketing. But I guess sometimes you just have to cut yourself some slack. My old buddy Paul is getting back into naval gaming, and we have had a couple of games this year using Battle Stations, Battle Stations. Finding these a bit slow moving Paul has turned to Victory At Sea, which look a lot simpler. Apparently those truly into naval wargaming find Victory At Sea a little too simplistic, which sounds promising for a beginner like me. On that subject, is there any set of rules released in the last 5 years which doesn't call itself a 'fast-play' set? All I can say is, some people's ideas of 'fast-play' and 'simple' are different from mine. There are still loads of sets out there with long lists of modifiers and firing that takes forever (for example). Maybe readers could tell me about their 'favourite' over-complex rules? 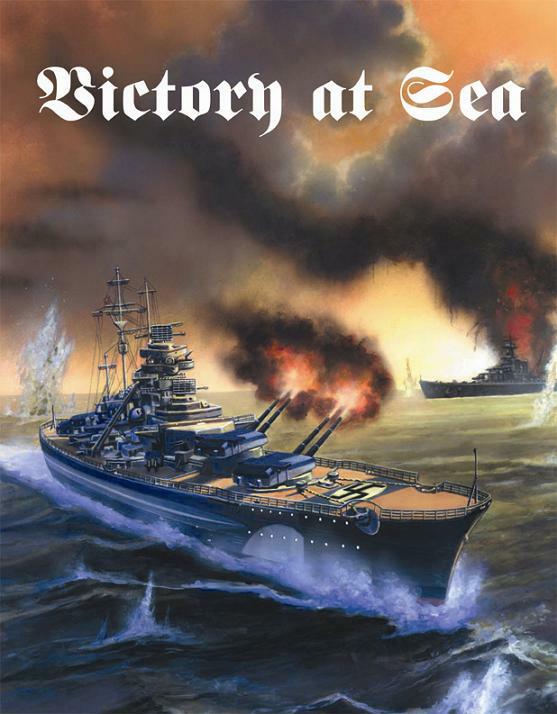 And any thoughts on Victory At Sea would be interesting. This great UK show is coming up on the weekend of 10th-11th September, at Newbury Racecourse. 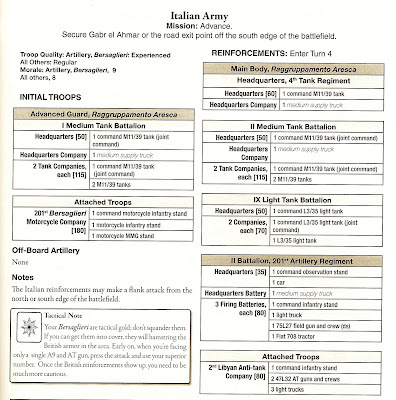 If any wargamers within range of the show haven't yet tried it out, I'd highly recommend it. Well organised, big, and a great venue full of light and space overlooking the racecourse. Unfortunately I won't be able to put on my Hochkirch game (see here) as the other gamers I was hoping to attend with can't make it, for various reasons. I don't think putting on the game solo as 'Billy No Mates' would really work! But I won't miss the show and will go down as a regular punter. Fortunately some friends of mine from the Blitzkrieg Commander website and the Portbury Knights club will be there with a couple of WW2 games, so there will be people to meet up with and chat to. 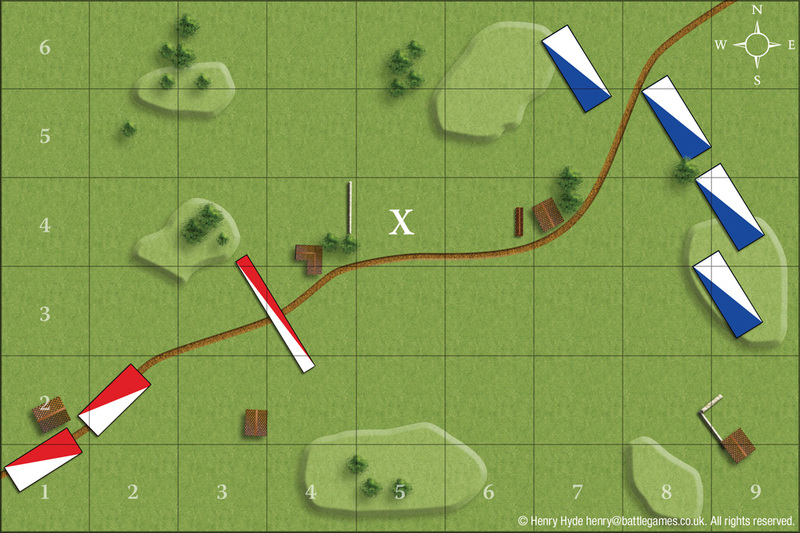 A sprinkling of SYW models to show you soon, and probably another Polish battle. See you then. It's not often these days I buy anything significant for my wargaming. Firstly, money is very tight so I find it hard to justify even a modest purchase when cash is needed for important things like food and petrol. More positively, my three collections are perfectly adequate for my purposes and I can have a good game with any of them without having to worry about needing more stuff. I find these days the butterfly impulse is very weak: without meaning to give offence, I find the attitude of 'oh, I've just seen those new figures and I just had to buy them' a bit daft. People even do this when the 'new figures' aren't in a period they currently wargame, or when they already have a perfectly good collection in that period. I guess for those with more time and money than me, this is one way to get enjoyment out of the hobby. But I'm afraid my response to such statements is usually something like, come on, get a life. I'm just being honest here. 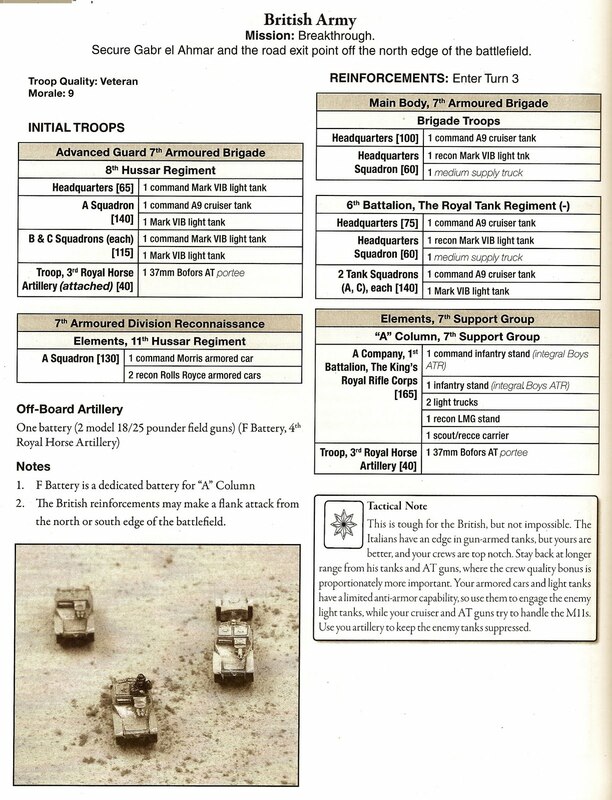 Further to this point, I mentioned in the previous post that I have been reading through old issues of Battlegames, and this included the regular 'Forward Observer' column by Mike Siggins. The column has recently come to an end and I shall miss it, but Mike was an unreconstructed butterfly who couldn't seem to resist anything new. I remember my astonishment (mixed, I have to admit, with a feeling of considerable superiority) when in the very first issue of Battlegames Mike congratulated himself on 'focusing down' to 'just ten projects'. Ten projects! Was this guy nuts? You can't possibly do justice to that many projects if you live a normal life. Surely even a full time wargamer would have trouble getting on top of ten projects? But there we are. Mike is an example of a wargamer who enjoys getting into everything. Maybe I'm just a miserable old git. Maybe there's no maybe about it. Anyway, moving on, I did weaken recently and posted off for a few things. On the Polish front, Battlefront Miniatures received an order for the new Polish Dice Set. I know, I know. Come on, get a life. But I'm afraid themed dice sets are a definite weakness of mine. Unfortunately, the national symbol on these sets now appears on the six rather the one, as the comparison with the old German dice set below illustrates. Why this has been found necessary beats me, but I guess it doesn't make a great deal of difference. I'm quite happy with them. Also in the order was an Sdkfz231 6-rad armoured car, another fairly recent release from Battlefront in connection with their new Blitzkrieg range. Unfortunately these models only come in twos, even if you only want one, but the model is only available in 15mm from this manufacturer and I have wanted one for a while, to give my recce units a bit of real early war flavour. The photos below show what a very nice model this is. The resin cast body is beautifully done with no flash or imperfections, and the metal parts fit onto it nicely, although they do need a bit of filing and cleaning up before use. The top three photos give you an idea of how the vehicle looks after construction. As for painting, those of you who want to know how a master does it can refer to this tutorial. For myself, I did a quick job with Humbrol paints. First I undercoated the metal parts in panzer grey, then once dry I gave the entire model a coat of the same. The wheels and underparts got a dry brush of dark earth, then the whole vehicle received a dry brush of khaki drill. And that was about it. The commander was painted black with blobs of flesh in roughly the right places. The only fiddly bit was painting the white crosses. Now personally I think that looks fine for a wargames model. As I have said before on this blog, painting is about my least favourite part of the hobby so I like to keep things to a minimum. 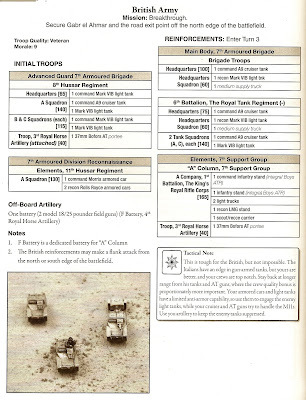 Finally, deciding I 'needed' some additional Polish machine gun teams, I thought I would check out the new range of 15mm figures available from Forged In Battle. Once again I had to order a blister pack of models which was more than I wanted (are you sensing a pattern here? ), but the figures that arrived were excellent and are a very good fit for my True North infantry, though just a little smaller and finer than Battlefront figures. The Forged In Battle site shows you how these figures look painted, so here they are as they come out of the pack. I would heartily recommend a look at this manufacturer's products. And that's about it for now. Some modest SYW additions have also recently been made, but they will have to wait for another post until some painting has been done. I also want to show off the civilians I acquired recently from Hovels and Willie Figures which are now mostly painted. Good gaming until next time. 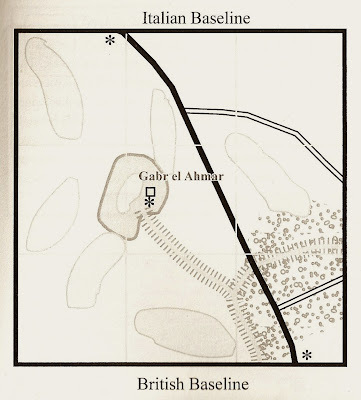 Now what Horse and Musket wargamer could come across this map and not want to fight out the battle? Not that I'm blowing my own trumpet here: the map comes from the 'Lead Gardens' blog which I have recently discovered and which I highly recommend (see Favourite Links). 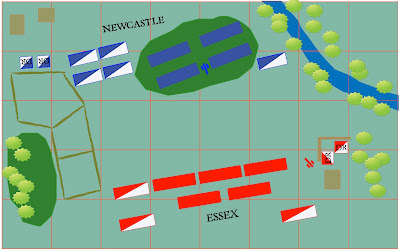 The map depicts the set-up for the fictional battle of Burnt Commons (September 1642), during the English Civil War campaign created by Littlejohn on his blog. I resisted the obvious temptation to make the side marked in blue on the map the Prussians. 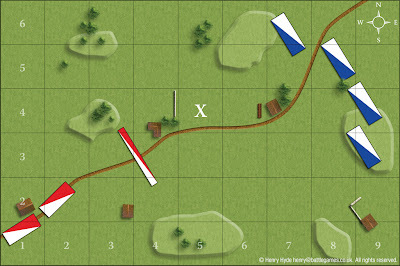 That hill position looked too much like a typical Austrian defensive set-up, with the Prussians set to do the attacking. Therefore the Prussians have a couple of grenadier regiments included, and with their cavalry outnumbered it looks like they will be relying on their well-drilled infantry to carry the burden, as so often in real life. 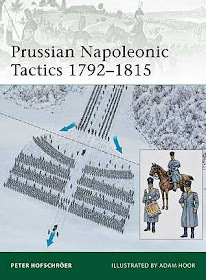 The Prussian infantry will be using the enhanced stats outlined in my post of 5th March, so we will see how they work. The dismounted dragoons on the right flank of both armies have been replaced by light infantry as I have no appropriate figures for dragoons on foot. The light infantry and hussars on both sides will use the 'marauder' rule, the hussars being set down where the isolated cavalry units are shown on the map. Two brigades a side is a small battle for BP, so I will be using one of my alternative Brigade Morale house rules. 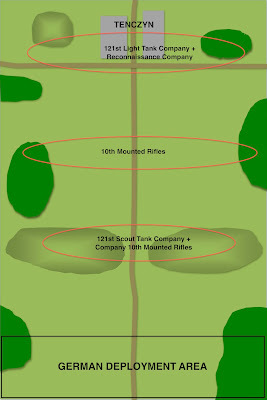 For this battle, units will count as lost for brigade morale only if they have been destroyed or have left the table and cannot return. That should avoid the action being over too soon. The first side to have both its brigades broken will lose. If the winning side then has no brigades broken, they have scored an outstanding victory. If they have one brigade broken, they have had a hard fight and only score a minor victory. 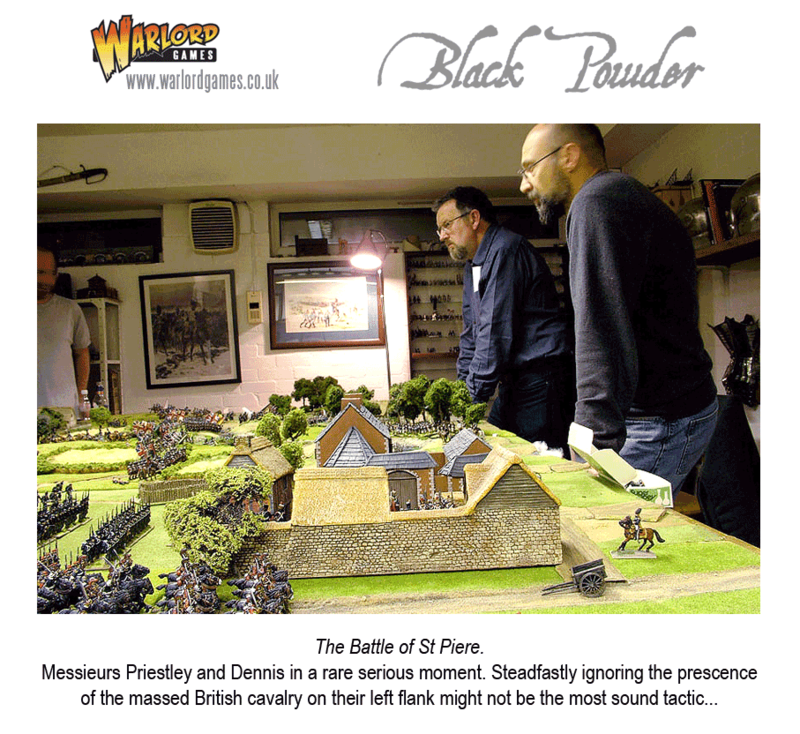 Original table size was 8' x 5', but the original battle featured 40mm figures. Therefore I chose a 6' x 4' table which would give about the same amount of room for my 30mm soldiers. "So is this battle going to be good for business?" The set-up. I was able to be pretty faithful to the scenario map. Prussians eye-view of the Austrian infantry position. The game gets under way. The Austrians were sprightly and aggressive from the word go. They moved off the hill and formed all their infantry battalions into a single line. The Prussians edged forward to meet them, intending to give them a taste of Prussian volley fire. On the Prussian left, their cuirassiers (foreground) decided to take the opportunity to charge their Austrian opposite numbers, as the second Austrian heavy cavalry regiment had headed off into the fields. 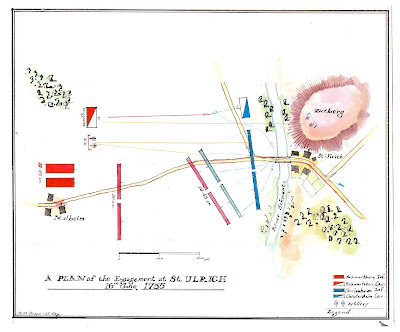 With an uncanny foresight that was to be a feature of Austrian tactics for the rest of the battle, the Austrians didn't countercharge but rested on their numerous supports. Despite the Prussians' charging advantage casualties were equal in the melee, and so the support bonuses saw the Prussians driven back through their own supporting dragoons. The subsequent Austrian 'sweeping advance' then destroyed the dragoons, leaving the situation as seen in the above photo. In the next turn the Austrians pressed home their advantage on the disordered Prussian cuirassiers. The result was predictable - the Prussian left wing cavalry had now been wiped out, and the cavalry brigade as a whole was broken. In the background the infantry firefight continues. ...but the Austrians are on a roll. The leading cuirassiers get 3 orders and set off to cause mayhem in the Prussian rear (right background). Note the Prussian hussars pushed into the far corner of the table by their compulsory retire moves (extreme background). The Austrian dragoons prepare to charge the nearest Prussian infantry battalion in front and flank. The Austrian command rolls continued to go well. The Prussian infantry battalion was driven back through the unit to its rear (centre background), although the doughty Prussians saw off one of the dragoon regiments with closing fire and shook the other in the melee. 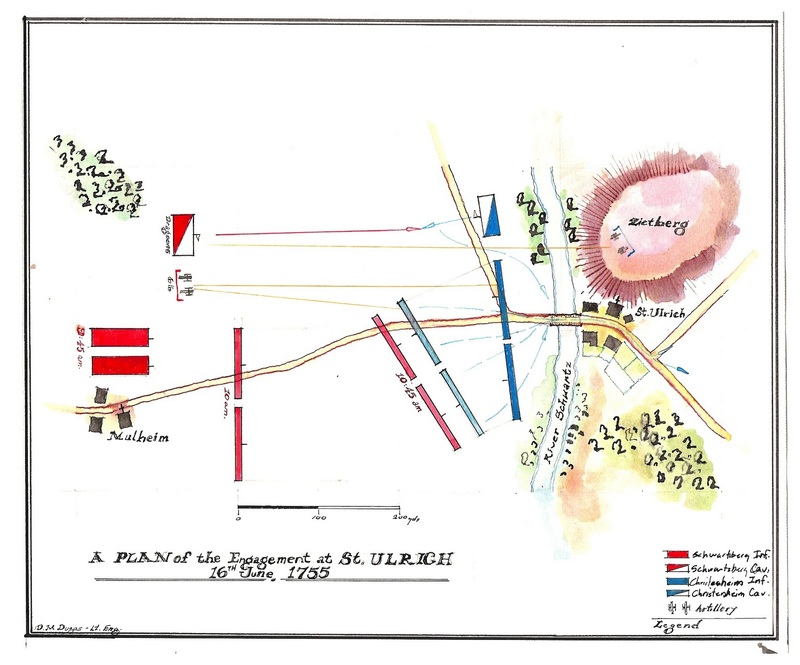 The marauding Austrian cuirassiers charged and destroyed the Prussian artillery battery: they are seen reforming on the left of the photo. Now the Prussian infantry were enveloped and under the most severe pressure. 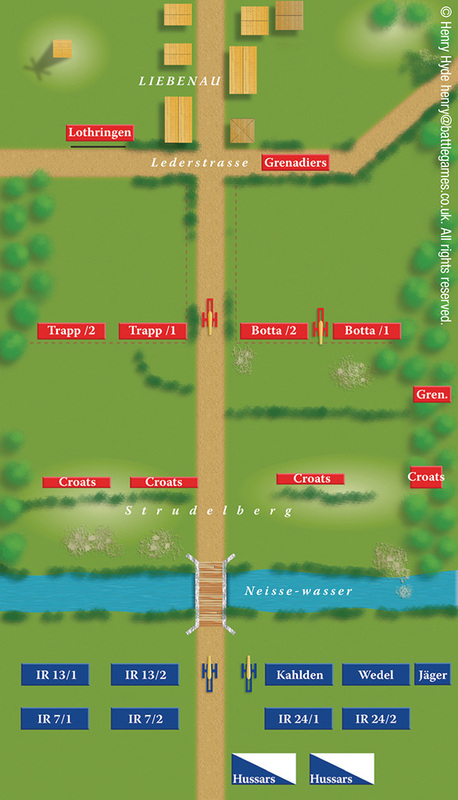 Austrian fire had already despatched the left hand infantry battalion of the Prussian first line: now the neighbouring grenadier battalion was destroyed. Under the revised brigade morale rules the brigade was technically still in being, but with 2 other Prussian infantry battalions shaken, the Prussian commander (myself) decided to call it a day. On the Prussian right flank the Austrian hussars had moved aggressively against the farm, hoping to push out the jagers. (We had decided that the farm would not count as a built up area, in keeping with what we saw as the spirit of the original scenario. The walls were cover, the building counted as decoration). The jager were affected by the breaking of the Austrian cavalry brigade and had to give way to the approaching hussars. They were then charged in the final move of the game, surprisingly holding their own. But this made no difference to the final result. The Prussian infantry were obviously about to be broken, whilst both Austrian brigades were intact. Therefore, the Austrians (curse them) had scored an outstanding victory. We had completed 5 moves in a leisurely 2 hours of gaming. The Austrian command rolls had rarely failed them and they ended up running rings around the Prussians, an unusual experience for Frederick's men. The rules had produced a typically sprightly and incident-packed game. The increased firing stats of the Prussian infantry didn't seem to give them an unfair advantage, and I will continue to use them. 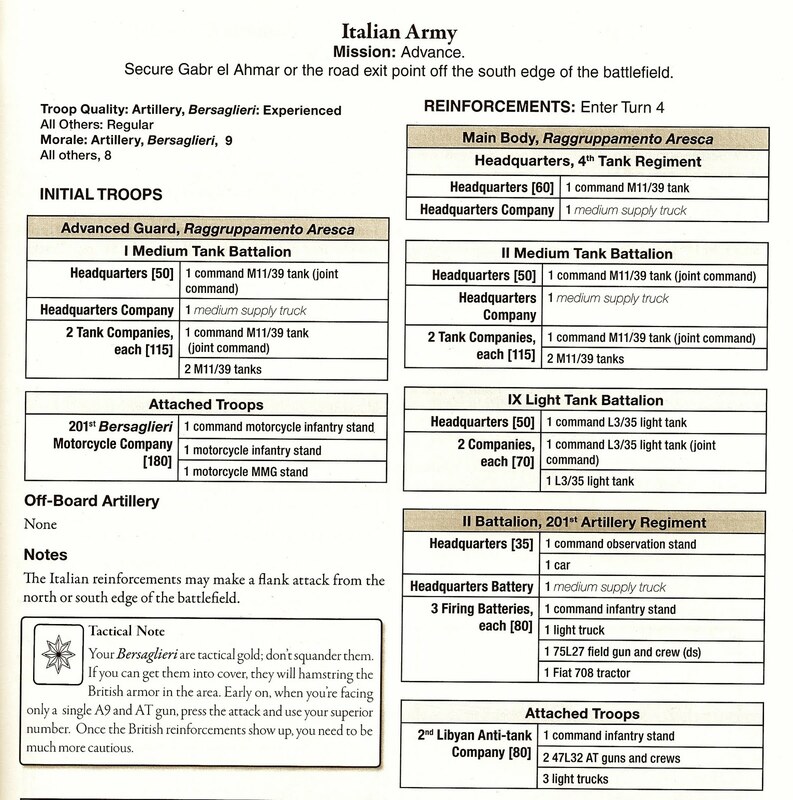 In accordance with tradition, we had consistently forgotten the -1 to command rolls when within 8" of the enemy (12" in the original rules). We always seem to forget the equivalent rule when playing Blitzkrieg Commander! Still, it was the same for both sides. Another rule we often forget is that firing dice rolls of 6 cause disorder. Why this important rule consistently slips our minds is a mystery. But the game was most enjoyable anyway. Paul's excellent bottle of Berberana Rioja simply added to the pleasure!